Instant Pot Lasagna Soup sounds like such a winner idea for dinner, but you can also make this tasty Lasagna Soup in the Slow Cooker if you prefer that method. Don’t you think it looks amazing? Fall is here and that means yummy soup sounds perfect for dinner. Justine from The Typical Mom says this Instant Pot or Slow Cooker Lasagna Soup is amazing and it certainly looks good to me! Start with stock with Italian flavors, add some meat, cheese, and pasta and you have a perfect recipe for the soup de jour! Justine uses rigatoni pasta, but she suggests bowtie pasta if you prefer. One thing that makes this Lasagna Soup so amazing is that this recipe can work for the Instant Pot or slow cooker so everyone can choose the method they prefer! It takes only 20 minutes start to finish in the Instant Pot, or use the slow cooker and let the smells fill your house. And this amazing soup would make a delicious dinner, don’t you agree? 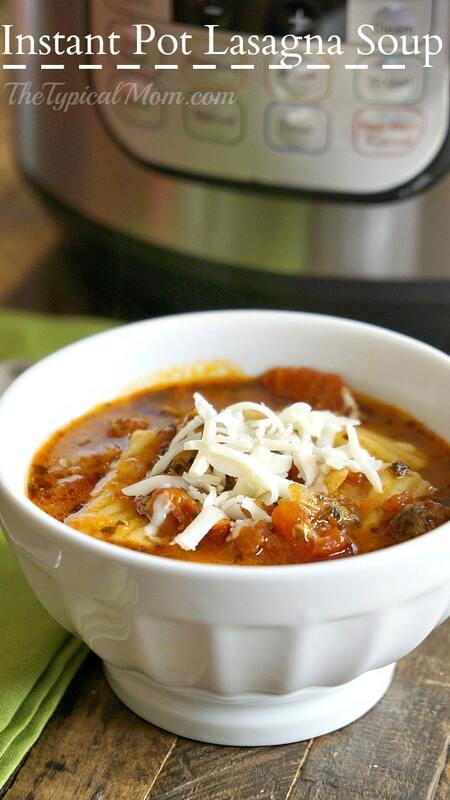 Get the complete recipe for Instant Pot or Slow Cooker Lasagna Soup from The Typical Mom. Check out 50 Amazing Instant Pot One-Pot Meals!